It is extremely rare that we are treated to true political theater. So much of it is fabricated, which is the entire point of political theater, really. However, every once and awhile comes an unexpected series of events that transpires, as they did over the past 72 hours, which defies the gravity of our system. And if you are lucky, these series of events reveal much about what is phony and pathetic. Such a thing has occurred and it forced me to trash what I was writing and write something else. Not quite stop-the-presses, but annoying just the same. 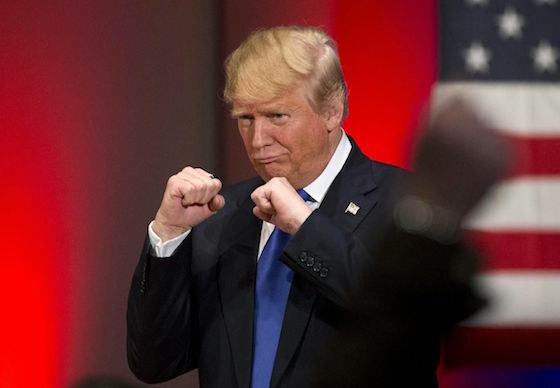 Citizen Donald J. Trump, the presidential nominee front-runner of the over 150 year-old Republican Party saw fit to boycott his party’s final “debate” in a state holding the first voting for the 2016 campaign five days hence. He did so in protest over who would be moderating said “debate” and embroiled himself in combat with easily the most important media outlet in the Republican field. In protest, Trump held a competing event merely five miles away, covered by any and all remaining networks, which he thrashed together in a day. The “debate”, more a showcase (as noted in this column previously several times) in it does not allow for true point-counter-point argument of ideas to be presented as alternatives to each other, was hosted by the most powerful media voice of the right wing, FOX NEWS, a conglomerate so effective at propaganda it has shifted the very concept of television news irreparably for the rest of existence. It is important to understand the gravity of this battle. Both FOX NEWS and Donald Trump live in the same fantasy stratosphere. In fact, they thrive in it. And when annoying things like factoids become an inconvenience to your mission statement, then it is nearly catastrophic when a similar, completely delusional force pushes back. Please try and grasp the horrifying beauty of this: the Republican front-runner, who leads in every poll imaginable over at least a dozen states, has made FOX NEWS stand trial for the very thing it was created to achieve. And one very important abomination was unwittingly uncovered during this whole wonderful fiasco. Trump ostensibly held his event as a fundraiser for veterans. Interestingly, many veterans’ charity groups boycotted Trump by stating he was grandstanding by using veterans as a political tool. This argument, while it is most likely true, makes no sense on the face of it. Why would an organization created to get contributions ignore someone holding an event to do just that unless you were against them ideologically and/or politically and therefore you are in reverse also using veterans as tools? when annoying things like factoids become an inconvenience to your mission statement, then it is nearly catastrophic when a similar, completely delusional force pushes back. But that is not the kicker; where our little stripping bare of the disgusting nature of our collective fantasyland gets real is the mere fact that we, a nation obsessed with war, leave our veterans to need charity groups to care for them. We always seem to find the tax money to “bomb them back to the stones age” or “make the sand glow” or “shock and awe” and “boots on the ground” all over the place, but we have nothing in the budget to deal with the fallout? This is the ugly truth of this country, which is always quick to go into war and yell about war and defense and supporting our troops, but the veterans of these national sins are left to beg for supper? How do we call this the greatest country on earth in the face of it? How do we brag on our exceptional nature and wave our flags with so much gusto while this goes on? All that money spent on making war and apparently none of it left to face its gory results? In the rarest of times political theater provides us much needed clarity. This one sure as hell did.